Mixcraft software updated to version 7. Acoustica's Mixcraft software is a simple, home/project-studio DAW that comes in at a reasonably low price point. Version 7 heralds the arrival of a 64-bit version, an upgraded interface, advanced audio functions such as warping, timestretching and quantisation, better support for control surfaces and more. Mixcraft's Performance Panel brings a more creative bent to the software, synchronising loops, clips, samples etc for real-time launching of material at various points in a session. In line with this, Mixcraft has been given better controller support. As well as loads of new soundware additions, there are two new samplers and two new virtual instruments included in version 7. The Pro Studio version of Mixcraft 7 put the focus firmly on its extra bundled plugins. Three virtual analogue synths and a grand piano bulk up the instrument credentials, while the effects suite betters the standard version's count of 25, adding in a further 27 for a grand total of 52. Check out the full list for both versions at bit.ly/MixcraftInclusions. 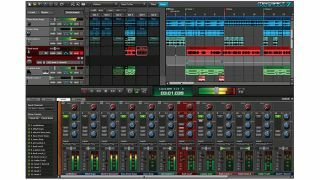 Mixcraft 7 standard will set you back $89.99, and Mixcraft Pro Studio 7 costs $164.95. Find out more on the Acoustica website.